It doesn’t matter how many generations we are away from the roots of our ancestors in the Isle of Man, nor how far in distance from our heritage homeland. It seems the love of the sea continues to flow through the veins of many a QUALTROUGH descendant. This was proven is a very dramatic way in March 2000 when New Zealand, with their boat, TEAM NEW ZEALAND, was sailing the final race against the Italian challenger, PRADA off Auckland, New Zealand in the America’s Cup Yachting Races. Russell Coutts, top skipper in New Zealand yachting for many a year, and who had skippered Team NZ to a 4 – nil lead over Prada, requested his young reserve New Zealand skipper to take the helm in the fifth race. In winning this race, New Zealand was assured of winning the America’s Cup for the second time. Dean Barker took the helm of Team New Zealand and made America’s Cup history when he took the boat over the line in an impressive win. At 26, he was the youngest sailor ever to skipper an America’s Cup yacht to victory – and he had never been involved with an America’s Cup campaign before. Dean began his sailing career at 10 years of age and his first solo sail ended in disaster when he got stuck in the middle of Lake Pupuke (Auckland) and had to be rescued. An ominous start to a career which was to prove, in a very short time, to be very distinguished indeed. Sixteen years later he went on to make history in the America’s Cup for New Zealand. Dean has amassed a huge range of yachting titles in his brief career – in P-class, Laser and match racing. In 1990 he won the World Single-handed Youth Championship. Having just missed the Finn dingy Olympic berth in 1996 for New Zealand, Russell Coutts asked Dean to try out for Team New Zealand 2000. He was sent out on the match racing circuit and within a year was one of the world’s top five match-racing skippers – ranked No 4 in 1999. As protégé to Coutts, Dean was credited with sharpening Coutt’s skills over the two years building up to the America’s Cup in New Zealand in 1999-2000. Having now become blooded in the final race win on March 2 2000 over the Italian boat Prada, Dean will be the primary helmsman in the next America’s Cup campaign and will run the New Zealand sailing team. 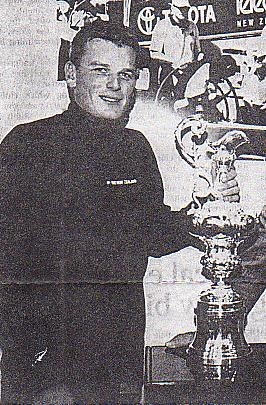 Since the America’s Cup, Dean has continued on his winning way, having won the Kenwood Cup and been competing in the Swedish Match Grand Prix Tour later in 2000. NZ match race champion in 1997; Australia Cup winner in 1998; Runner-up in the ACI Cup in Croatia, 3rd in the Swedish Match Cup in Sweden and 4th in the Roberto Trombini regatta in Italy. All in all, not a bad effort, for a young yachtsman whose Manx background of yesteryear, probably had something to do with his ability!! His future in world yachting seems assured for many a year.